Lately, the convection theory has been much debated, as modern techniques based on 3D seismic tomography still fail to recognize these predicted large scale convection cells. Alternative views have been proposed. 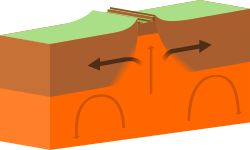 In the theory of plume tectonics developed during the 1990s, a modified concept of mantle convection currents is used. It asserts that super plumes rise from the deeper mantle and are the drivers or substitutes of the major convection cells. These ideas, which find their roots in the early 1930s, find resonance in the modern theories which envisage hot spots or mantle plumes which remain fixed and are overridden by oceanic and continental lithosphere plates over time and leave their traces in the geological record (though these phenomena are not invoked as real driving mechanisms, but rather as modulators). If the Earth's crust was expanding along the oceanic ridges, Hess and Dietz reasoned like Holmes and others before them, it must be shrinking elsewhere. 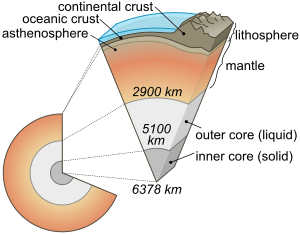 Hess followed Heezen, suggesting that new oceanic crust continuously spreads away from the ridges in a conveyor belt–like motion. And, using the mobilistic concepts developed before, he correctly concluded that many millions of years later, the oceanic crust eventually descends along the continental margins where oceanic trenches—very deep, narrow canyons—are formed, e.g. along the rim of the Pacific Ocean basin. 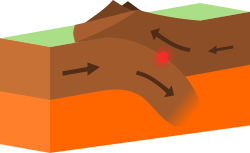 The important step Hess made was that convection currents would be the driving force in this process, arriving at the same conclusions as Holmes had decades before with the only difference that the thinning of the ocean crust was performed using Heezen's mechanism of spreading along the ridges. Hess therefore concluded that the Atlantic Ocean was expanding while the Pacific Ocean was shrinking. 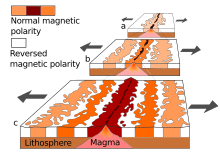 As old oceanic crust is "consumed" in the trenches (like Holmes and others, he thought this was done by thickening of the continental lithosphere, not, as now understood, by underthrusting at a larger scale of the oceanic crust itself into the mantle), new magma rises and erupts along the spreading ridges to form new crust. In effect, the ocean basins are perpetually being "recycled," with the creation of new crust and the destruction of old oceanic lithosphere occurring simultaneously. Thus, the new mobilistic concepts neatly explained why the Earth does not get bigger with sea floor spreading, why there is so little sediment accumulation on the ocean floor, and why oceanic rocks are much younger than continental rocks. A symposium on continental drift was held at the Royal Society of London in 1965 which must be regarded as the official start of the acceptance of plate tectonics by the scientific community, and which abstracts are issued as Blackett, Bullard & Runcorn (1965). In this symposium, Edward Bullard and co-workers showed with a computer calculation how the continents along both sides of the Atlantic would best fit to close the ocean, which became known as the famous "Bullard's Fit". One explanation for Venus's lack of plate tectonics is that on Venus temperatures are too high for significant water to be present. The Earth's crust is soaked with water, and water plays an important role in the development of shear zones. Plate tectonics requires weak surfaces in the crust along which crustal slices can move, and it may well be that such weakening never took place on Venus because of the absence of water. However, some researchers[who?] remain convinced that plate tectonics is or was once active on this planet. List of submarine topographical features – Oceanic landforms and topographic elements. 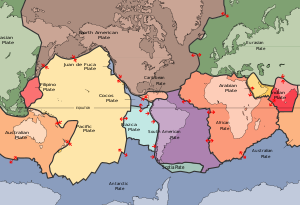 ^ "Plate Tectonics: Plate Boundaries". platetectonics.com. Archived from the original on 16 June 2010. Retrieved 12 June 2010. ^ Grove, Timothy L.; Till, Christy B.; Krawczynski, Michael J. (8 March 2012). "The Role of H2O in Subduction Zone Magmatism". Annual Review of Earth and Planetary Sciences. 40 (40): 413–39. Bibcode:2012AREPS..40..413G. doi:10.1146/annurev-earth-042711-105310. Retrieved 14 January 2016. ^ Meyerhoff et al. 1996. ^ Mallard, Claire; Coltice, Nicolas; Seton, Maria; Müller, R. Dietmar; Tackley, Paul J. (2016). "Subduction controls the distribution and fragmentation of Earth's tectonic plates". Nature. 535 (7610): 140–43. Bibcode:2016Natur.535..140M. doi:10.1038/nature17992. ISSN 0028-0836. PMID 27309815. ^ "Alfred Wegener (1880–1930)". University of California Museum of Paleontology. ^ Neith, Katie (April 15, 2011). "Caltech Researchers Use GPS Data to Model Effects of Tidal Loads on Earth's Surface". Caltech. Archived from the original on October 19, 2011. Retrieved August 15, 2012. ^ a b Ricard, Y. (2009). "2. Physics of Mantle Convection". In David Bercovici; Gerald Schubert. Treatise on Geophysics: Mantle Dynamics. 7. Elsevier Science. p. 36. ISBN 978-0-444-53580-1. ^ a b Glatzmaier, Gary A. (2013). Introduction to Modeling Convection in Planets and Stars: Magnetic Field, Density Stratification, Rotation. Princeton University Press. p. 149. ISBN 978-1-4008-4890-4. ^ van Dijk 1992, van Dijk & Okkes 1990. ^ "Pioneers of Plate Tectonics". The Geological Society. Retrieved 23 March 2018. ^ Casadevall, Arturo; Fang, Ferric C. (1 March 2016). "Revolutionary Science". mBio. 7 (2): e00158–16. doi:10.1128/mBio.00158-16. PMC 4810483. PMID 26933052. ^ Bortman, Henry (2004-08-26). "Was Venus alive? "The Signs are Probably There"". Astrobiology Magazine. Retrieved 2008-01-08. ^ Dyches, Preston; Brown, Dwayne; Buckley, Michael (8 September 2014). "Scientists Find Evidence of 'Diving' Tectonic Plates on Europa". NASA. Retrieved 8 September 2014. Hess, H.H. (November 1962). "History of Ocean Basins" (PDF). In A.E.J. Engel; Harold L. James; B.F. Leonard. Petrologic studies: a volume to honor of A.F. Buddington. Boulder, CO: Geological Society of America. pp. 599–620. Lliboutry, L. (2000). Quantitative geophysics and geology. Eos Transactions. 82. Springer. p. 480. Bibcode:2001EOSTr..82..249W. doi:10.1029/01EO00142. ISBN 978-1-85233-115-3. Retrieved 2010-06-18. Meyerhoff, Arthur Augustus; Taner, I.; Morris, A.E.L. ; Agocs, W.B. ; Kamen-Kaye, M.; Bhat, Mohammad I.; Smoot, N. Christian; Choi, Dong R. (1996). Donna Meyerhoff Hull, ed. Surge tectonics: a new hypothesis of global geodynamics. Solid Earth Sciences Library. 9. Springer Netherlands. p. 348. ISBN 978-0-7923-4156-7. Torsvik, Trond Helge; Steinberger, Bernhard (December 2006). "Fra kontinentaldrift til manteldynamikk" [From Continental Drift to Mantle Dynamics]. Geo (in Norwegian). 8: 20–30. Archived from the original on 23 July 2011. Retrieved 22 June 2010. , translation: Torsvik, Trond Helge; Steinberger, Bernhard (2008). "From Continental Drift to Mantle Dynamics" (PDF). In Trond Slagstad; Rolv Dahl Gråsteinen. Geology for Society for 150 years – The Legacy after Kjerulf. 12. Trondheim: Norges Geologiske Undersokelse. pp. 24–38. Archived from the original (PDF) on |archive-url= requires |archive-date= (help) [Norwegian Geological Survey, Popular Science]. Torsvik, Trond H.; Steinberger, Bernhard; Gurnis, Michael; Gaina, Carmen (2010). "Plate tectonics and net lithosphere rotation over the past 150 My" (PDF). Earth and Planetary Science Letters. 291 (1–4): 106–12. Bibcode:2010E&PSL.291..106T. doi:10.1016/j.epsl.2009.12.055. Archived from the original (PDF) on 16 May 2011. Retrieved 18 June 2010. Zhong, Shijie; Zuber, Maria T. (2001). "Degree-1 mantle convection and the crustal dichotomy on Mars" (PDF). Earth and Planetary Science Letters. 189 (1–2): 75–84. Bibcode:2001E&PSL.189...75Z. CiteSeerX 10.1.1.535.8224. doi:10.1016/S0012-821X(01)00345-4.